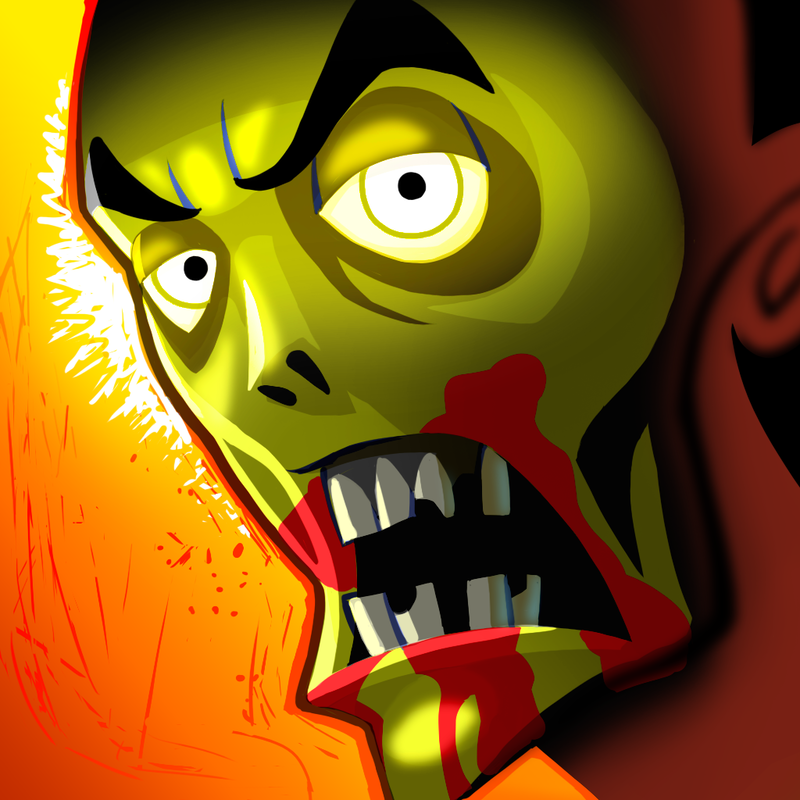 Zombie Puzzle Panic (Free) by Noodlecake Studios Inc is the latest game from the guys behind the Super Stickman Golf games and Flappy Golf. 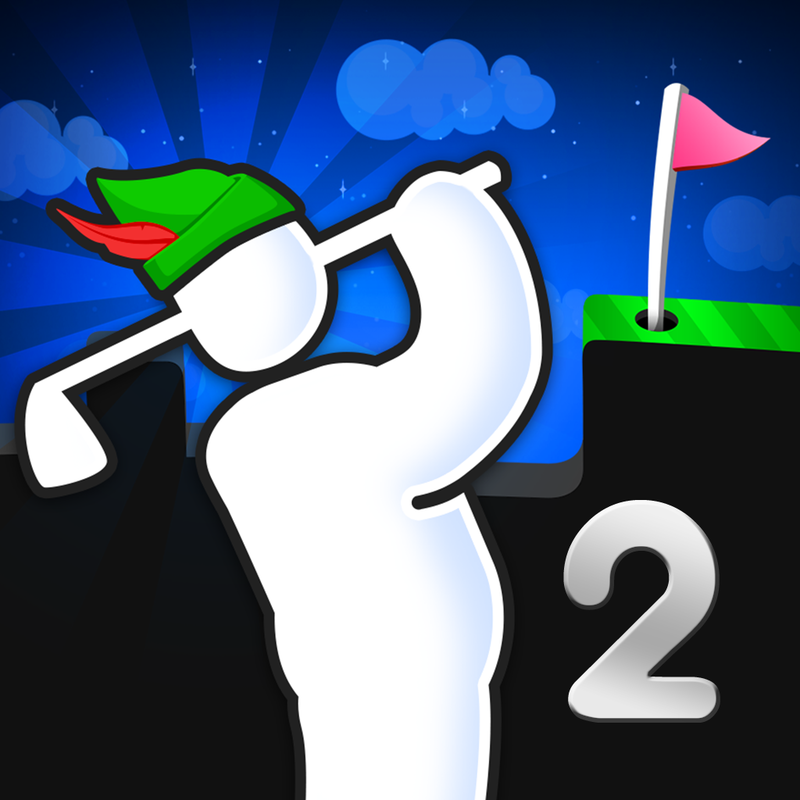 However, Zombie Puzzle Panic has nothing to do with golf like their other games. 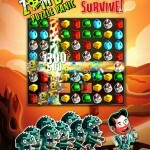 Instead, think of Candy Crush Saga and throw in pesky zombies, and you’ve got Zombie Puzzle Panic. 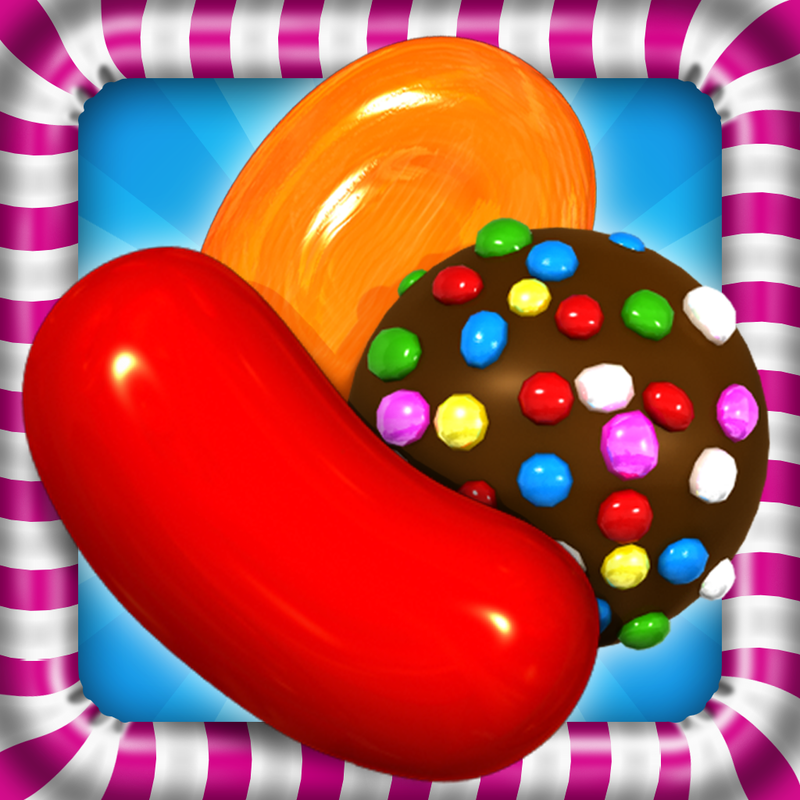 I’m definitely a sucker for match-three games, but I’ve never really enjoyed Candy Crush Saga, mostly because of how ridiculous King can be with trademarks and how it forces you to buy in-app purchases to advance. Since I’m a fan of Noodlecake Studios, however, I was pretty excited when I heard that they were publishing a new game in collaboration with developers Massive Damage, who created Please Stay Calm, a zombie apocalypse survival MMORPG. So I gave it a test this weekend, and for the time being, I’m satisfied with it. 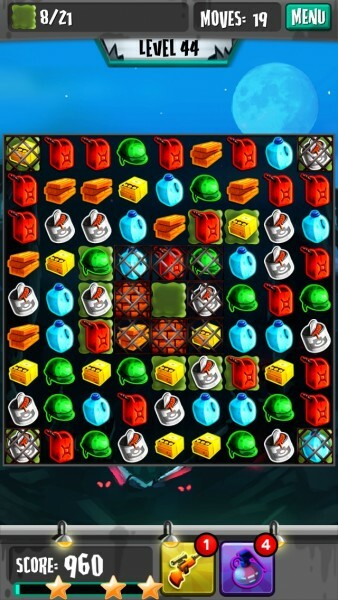 The visuals in the game are delightful, featuring smooth and colorful game pieces on each grid. Even though it’s a simple match-three game, I love the detail that you can find in each piece, as well as character sprites like the bodyguard, scientist, survivors, and different zombies. 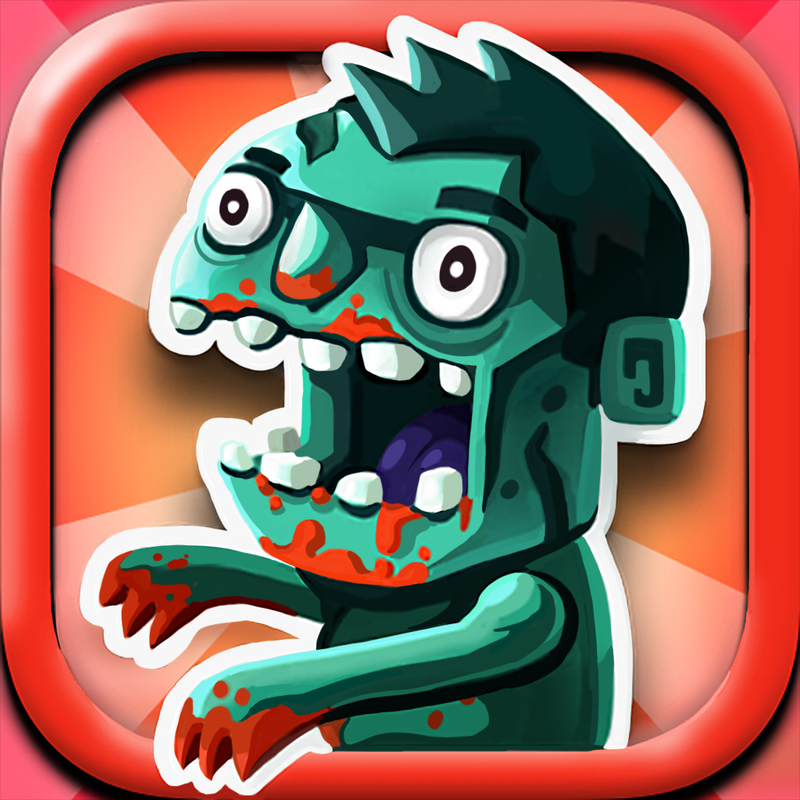 Even though the game is set in an apocalyptic world overrun with zombies, the game is bright and vibrant, which is great for a puzzle game. The graphics are also inspired by the 1950s retro look, which is a bit reminiscent of Fallout 3. 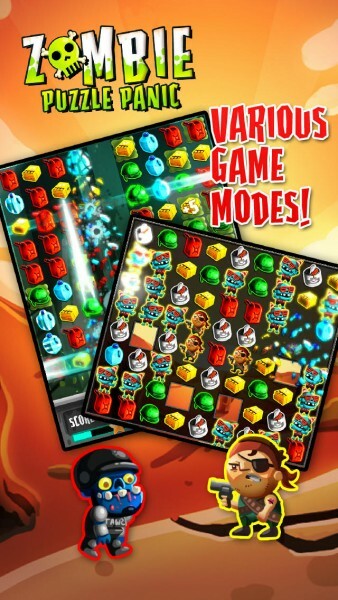 Animations are smooth and fluid, especially when you get a big chain reaction combo — things get a bit explosive, so to speak. 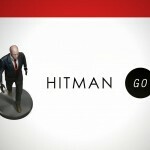 I also enjoy the chilling soundtrack, as well as the sound effects, which add a layer of charm to the game. 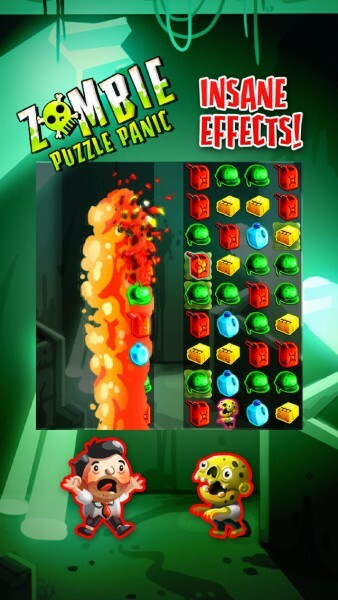 Like other puzzle games of this type, ZPP is level-based. Currently, I’m on level 44, but there appears to be a total of 107 currently available stages (followed by a “…” so I can only guess that more will be added later). I’m a bit disappointed that there is no story whatsoever in this game, but I suppose that’s to be expected. 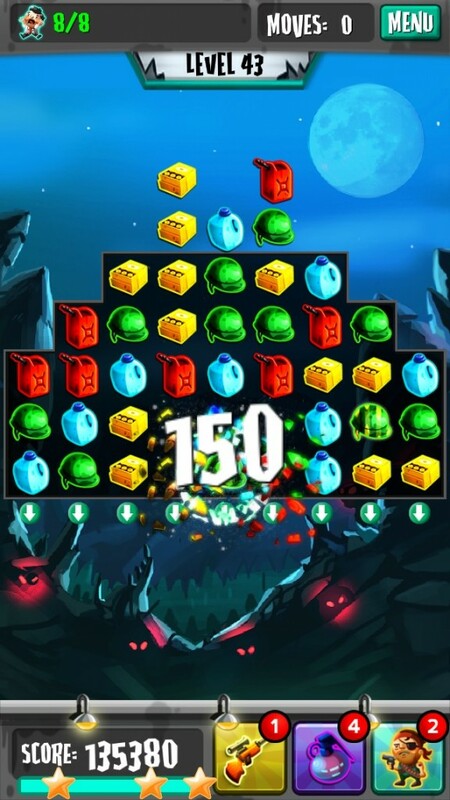 In order to advance in the levels, you will have to clear the previous one with at least one star, though you can get three stars maximum. The game also uses an energy system, and you have five hearts to start with — failing a level means you lose one. They will refill over time, so it’s a good time to take a break when you’re out. You can tell how many stars you’re going to get on a level just by looking in the bottom left while playing — there’s a gauge that will fill up and get you a star once you reach the threshold. 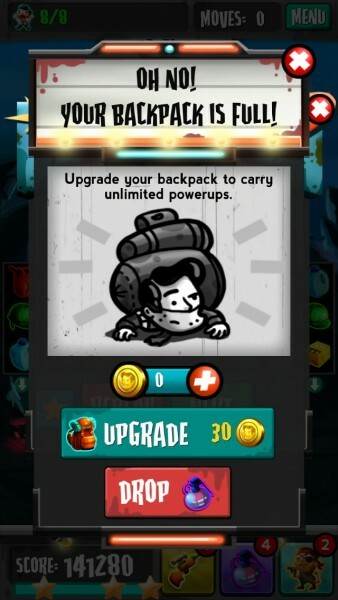 If you get three stars on a level, you can get a crate of loot, which can be one of three of the power-up items, though you only have enough space in your “backpack” for a certain amount of each. If you want to stock up on more power-ups, you’ll have to upgrade your pack with gold coins, which are the game’s premium currency, and only obtainable through IAPs, unfortunately. Still, I’m glad that the game actually gives out freebies, though sometimes it’s incredibly challenging to get the three stars needed. The gameplay itself is easy, especially if you’ve played match-three games before. 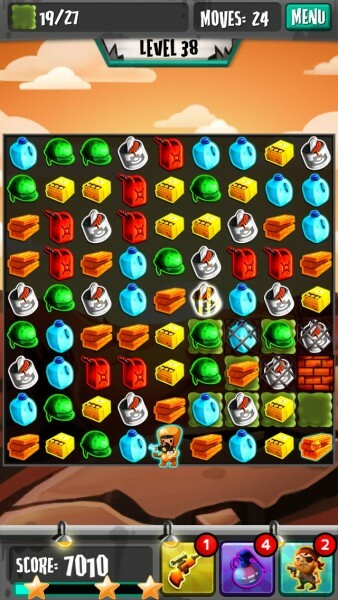 Each level will have a specific grid layout, and you’ll need to make matches of at least three or more in order to clear them out. If you make a match of four either horizontally or vertically, you get a piece that can eliminate an entire row or column in the next match. 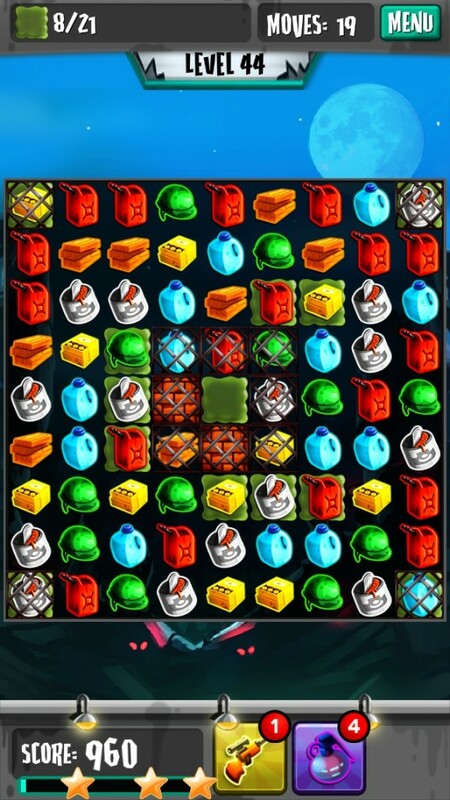 Get a match of six pieces in an “L” shape and you create a piece that can blow up all adjacent pieces when matched. 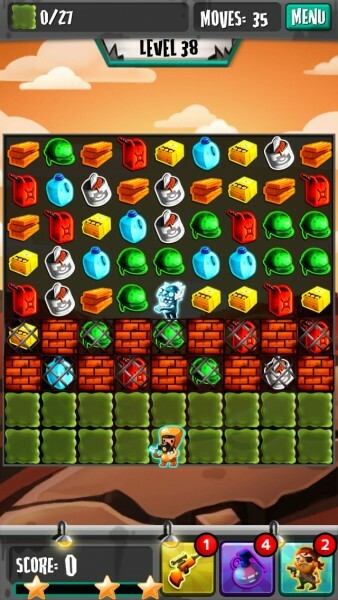 If you can match five pieces, you create a grenade that can clear out all pieces of the next color you match it with. To keep each level different, there are objectives that you have to meet before you officially clear the stage. 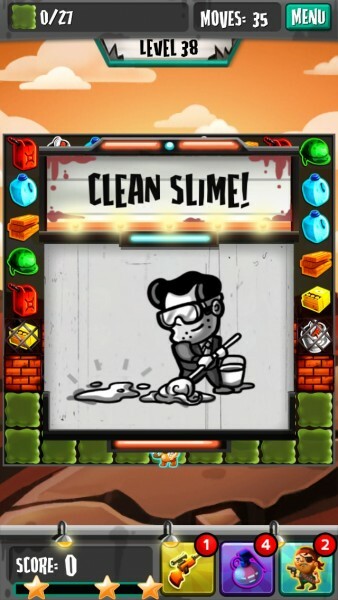 These include salvaging a certain number of specific pieces, killing zombies, rescuing survivors, cleaning slime, and of course, just getting a certain amount of points. And if there are scientists on the game board, you’ll need to protect them at all costs, even if there is another objective — if the scientists get eaten by zombies, it’s game over. 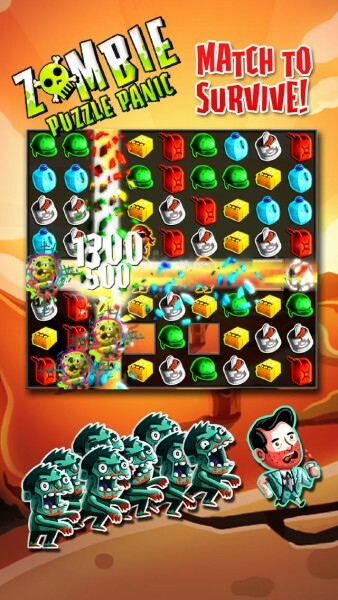 The zombies make things difficult because they move after every turn, and special zombies, like the ice one, will freeze blocks. 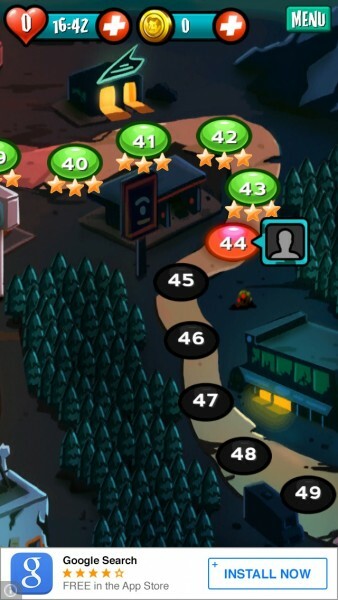 Unless a level is time-based, you also only have a certain amount of moves to complete the objective, which makes the game infuriating at times. If you run out of moves, you can buy more with the premium gold coins, or watch videos to get three moves for free. As I mentioned, there are power-ups available that you can use in a pinch. 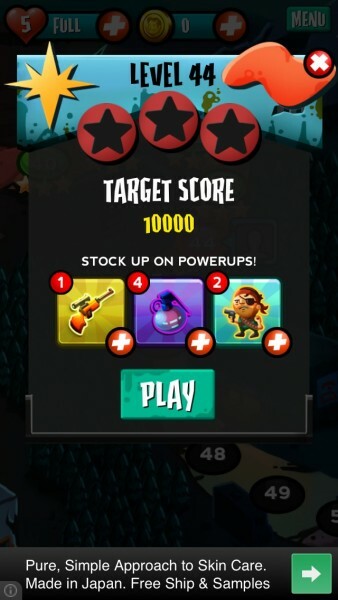 The power-ups include a rifle to eliminate a single piece on the board, a grenade (the same one you get for making a match of five), and bodyguards who shoot nearby zombies, but need a turn to reload their gun. Earning three stars will get you a freebie, but there are limitations on the amount you can carry of each (about four for the rifle, three for the grenade, and two bodyguards). I’ve actually played the game quite a lot over the long weekend, and I’m enjoying it for the time being. 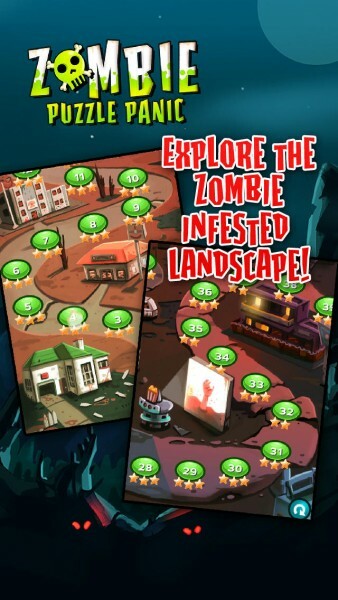 I’m usually not a big fan of these games, but the zombies do make things interesting, and you need even more strategy to successfully complete each level. Plus, I get a big sense of satisfaction when I finally beat a level I’ve been stuck on without having to rely on IAPs to get past it. 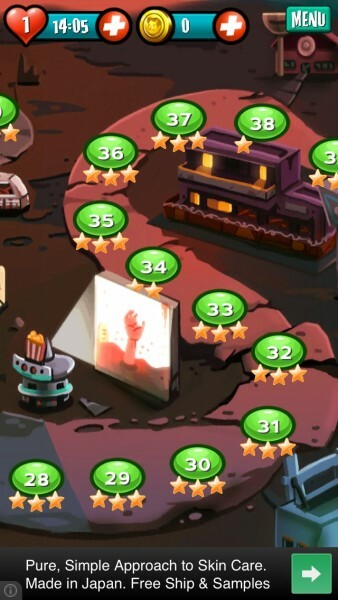 I just wish that the game gave you some way of getting gold coins without resorting to IAPs, as it gives you freebie power-ups for three-star levels. 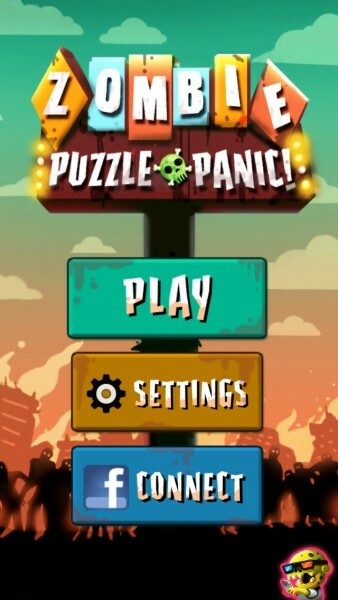 Still, if you’re in the mood for a challenging match-three game to check out, then I recommend downloading Zombie Puzzle Panic. 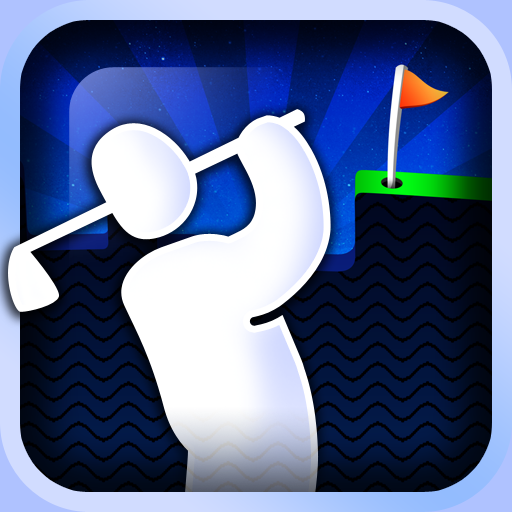 You can find it on the App Store as a universal download for free with in-app purchases.